While I realize it is past Monday I was unable to do my Monday post due to being super sick. 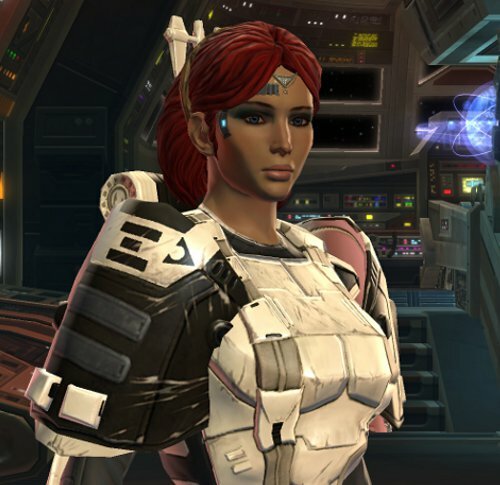 However now that I’m back on the side of the living I figured I’d share with you my adventures in Old Republic over the last week. My guild made a very big decision this week. Instead of our old set up, where we were running 2 8-man progression Ops groups weekly, we have decided to merge into a single 16-man Op group and tackle the content as a whole. Our first run was on Wednesday night where we attempted a story mode Explosive Conflict. I have to say I was very impressed with how well we did. Our Ops are scheduled for three hour runs and in that time on Wednesday we managed to kill all but the final boss. That is a very impressive first run as a 16-man guild, especially considering not everyone had previously been through Explosive Conflict. We picked up again on Thursday. After a couple tries on Kephess, the final boss in Explosive Conflict, we walked away with some really nice loot and the satisfaction that our guild can do this no problem. 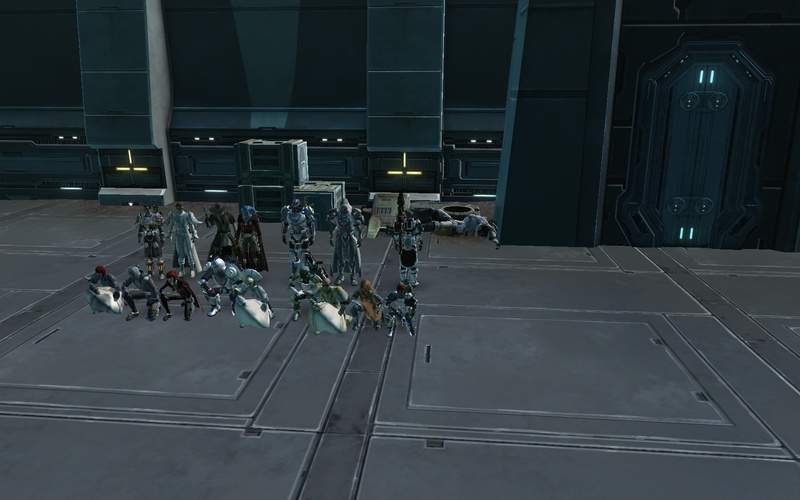 Since we still had about two hours or so left in the night we decided to pop over to Karagga’s Palace and attempt a 16-man Nightmare run. The first boss Bonethrasher went down clean as anything. However we did hit a bump during Jarg and Sorno, the second boss. Sadly we ended the night with the pair still alive but I am looking forward to what we will be doing this week now that a lot of our group got several pieces of new gear out of Explosive Conflict. Our first 16-man Kephess kill. Tonight will be our second run of 16-man Explosive Conflict and I am really hoping that we can clear it in the three hour raid time frame allowing us to devote tomorrow’s full night to dealing with Nightmare Karagg’as Palace. Today is May fourth and that means it is Star Wars day! The day of the year where Star Wars fans from across the universe celebrate their love of Star Wars. In celebration of Star Wars Day, I am spotting my Star Wars T-shirt, drinking my Dr Pepper out of a giant Star Wars cup, listening to the Star Wars soundtracks for all six movies and most importantly Playing Star Wars: The Old Republic all day long. Yes, I realize the last one isn’t anything new, I play SW:TOR all the time regardless of what day it is. But it is fitting to play a Star Wars video game on Star Wars Day. So my fellow Star Wars fans, and those who may not care for Star Wars that much (shame on you), what are you doing to celebrate Star Wars day? Also, on a completely unrelated note. Does anyone else dislike the new WordPress layout? Or is it just me? Well it’s Wednesday and that means it’s time for my weekly NaNoWriMo update. So far things have been going well for my writing. I have found out that I write so much better when I have all of my information done ahead of time, so that if I ever reach a spot where I’m not sure what to write next I simply look at my outline and start writing again. Last year I wrote completely by the seat of my pants with only a faint glimmer of an idea and while I did reach the fifty thousand word mark it was a struggle most days to write. I would have to say that 95% of what I wrote last year was garbage and that if I ever did anything with that “novel” again it would be a complete rewrite. This year I have been averaging between two thousand and twenty-five hundred words per day, which has keep me about two days ahead on my writing so far. This time around the quality of my writing is much better since I know what I want to write and aren’t simply grabbing words out of thin air and slapping them into Word. As of right now I sit at just over seventeen thousand words and I have yet to do my daily word count for the day. I am certainly enjoying writing my novel and look forward to seeing it finally brought to life. However today I got an email that will most certainly interrupt my writing this weekend. In that email was a beta invite for the upcoming MMO Star Wars: The Old Republic. I am horribly excited about this. I have had my eye on this game since BioWare first announced it was in the process of making in over a year ago. Ever since I stopped playing WoW I have struggled to find an MMO that I enjoy. I tried Rift, and while it was interesting I became bored with it very quickly. The idea of going back to WoW makes me shiver so the only thing that was left to do was wait for SW:TOR to come out. And now I will be getting my first chance to play the game starting this weekend. I can’t wait. Of course this means I will have a slight interruption in my writing as I will be busy playing and won’t have the time to devote to NaNoWriMo. So, the plan is to write extra today and tomorrow to add a buffer to my word count so that I don’t fall behind during my non-writing weekend. My goal is to write at least five thousand words both today and tomorrow, which honestly can be done easily since I have been stopping myself from getting too far ahead each day up until now. In other minor news, I finally finished the last it of painting in the basement. Once it dries I will give it a second coat (if needed) and then all that is left to do is paint my sons room, which I plan to do next week. So glad to have this renovation stuff nearly done, but I must say the house looks great now, as opposed to the alright look it had before.